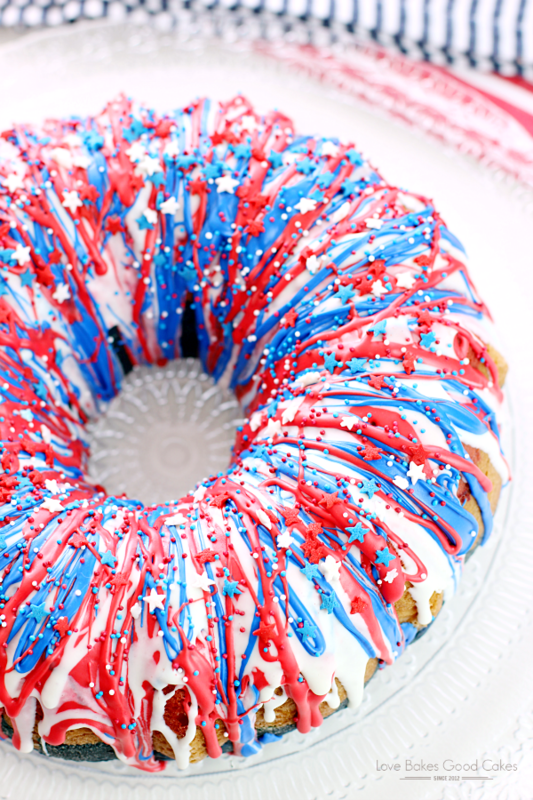 Show your patriotism with this Firecracker Cake! The red, white, and blue runs inside and out!! Great for Memorial Day, the 4th of July or any occasion you want to share a little American pride! The school year is winding down which means, summer is oh so close!! Here in the Phoenix area, it sure feels like summer! With highs in the 90’s with a few days creeping into the triple digits, I’m just going to call it summer …. we’re close enough. Amiright?! I love everything about summer … okay, technically not the 120 degree heat, but I’ll take the Arizona heat over shoveling snow in the winter any day! Needless to say, we’re gearing up for an awesome #summer2016 in the Love Bakes Good Cakes house! Like many Americans, we look at Memorial Day weekend as the unofficial start of summer. If you can believe it, we’re looking at summer only being about 2 weeks away, y’all!! Since my birthday is on the 4th of July, this will probably be my birthday cake this year … and yes, I’m kind of already thinking about a menu!! 😀 I will have to get myself some of these Sparkler Candles … wouldn’t that be a fun birthday cake for the 4th of July?! Of course, it would be super fun to celebratre America’s birthday with those awesome sparkler candles too! Maybe it will become a new tradition?! Preheat oven according to cake mix directions. Generously grease and flour a 12-cup bundt pan; set aside. Make cake batter as directed on box, using water, oil and egg whites. Pour 1 cup of the batter into a small bowl; stir in red food coloring until well mixed. Pour another cup of the batter into a separate bowl; stir in blue food color until well mixed. Pour red cake batter into bottom of pan. Carefully pour the white batter over red batter in pan. Carefully pour blue batter over white batter. (The blue batter does not need to cover the white batter completely). When you add the batter to the pan, do not mix with a spoon. Just pour it in so the colors don't mix but rather, just rest on top of each other in the pan. Bake as directed on box or until toothpick inserted near center comes out clean. Cool cake 10 minutes. Meanwhile, place cooling rack over cookie sheet. Turn pan upside down onto cooling rack. Cool cake completely, about 30-45 minutes. When cake is cool, divide the frosting evenly into 3 microwavable bowls. Microwave 1 bowl of frosting uncovered on HIGH a few seconds until smooth enough to drizzle over cake. With spoon, drizzle all of the 1st bowl of microwaved frosting all over the cake, back and forth around the cake in a striping pattern. Repeat microwaving second bowl of frosting until smooth. Stir in a few drops of the blue food coloring until well blended. Drizzle over cake, scattering back and forth. 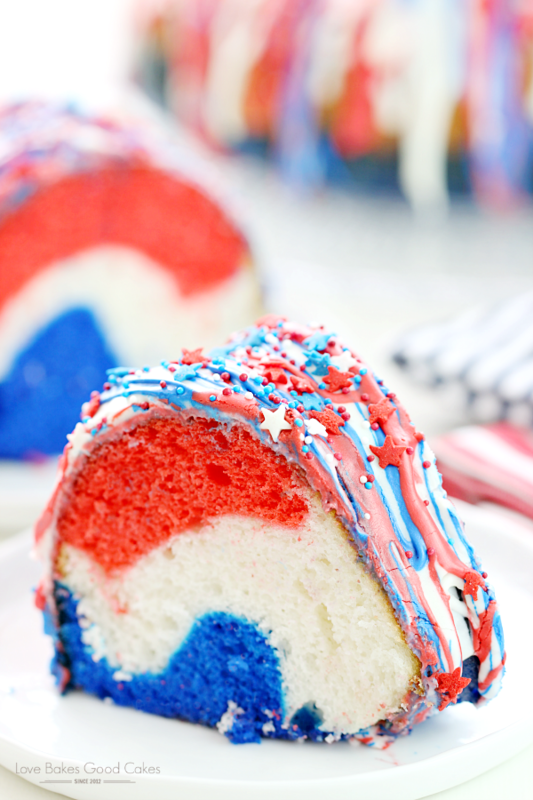 Repeat with remaining frosting and red food coloring, making sure red, white and blue can be seen on the cake. 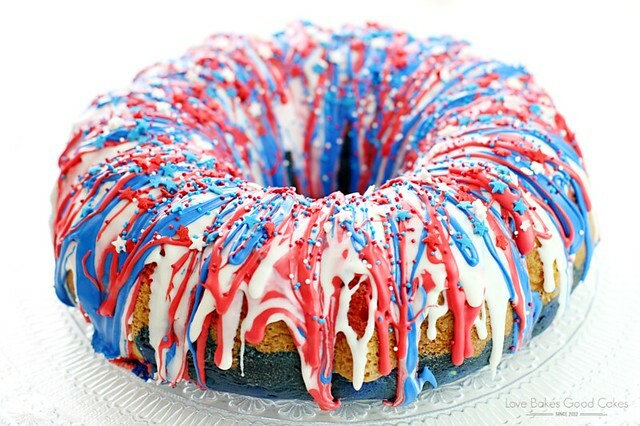 Sprinkle with red, white and blue sprinkles, if desired. Let cake stand at room temperature until frosting is set before serving. I personally prefer to use Wilton Icing Colors. For this recipe, I used I "Red - No Taste" and "Royal Blue". I think the colors are more vibrant, however, you may use any kind of food coloring you have it on hand. Visiting from Crazy For Crust! 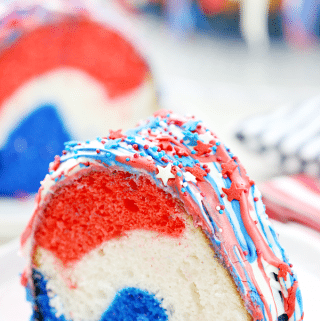 This dessert looks perfect for 4th of July! Thanks for sharing!! 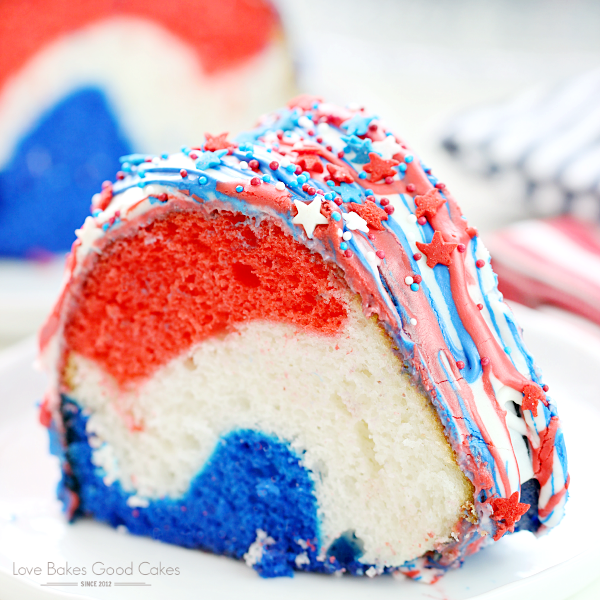 I love how easy this cake is, it is perfect for the 4th of July. It also looks really good. 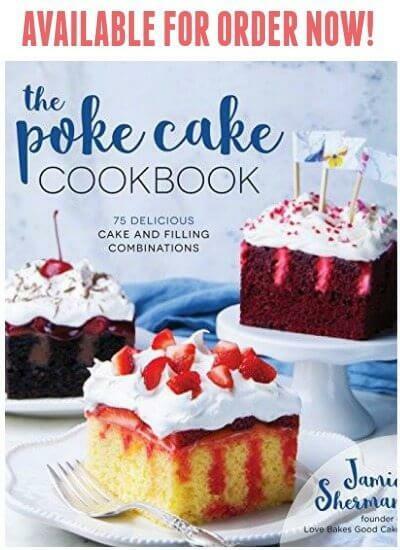 I would love if you would share this and any other posts at Showcase Your Talent Thursday http://whatscookinglove.blogspot.com/2012/04/showcase-your-talent-thursday-4.html. I hope to see you there! WOWWWW this cakes looks amazing! I really love playing with colors. Thanks so much for linking up to Creative Thursday this week. I am SO making this for 4th of July this year. And to think of all the other holidays its perfect for too. Thanks so much for sharing. 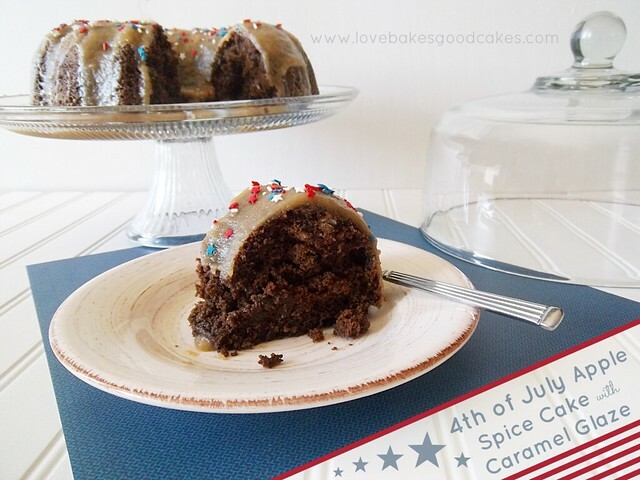 I just love your Firecracker Cake, perfect for the upcoming holidays. Your recipe looks awesome. Hope you have a great week end and thank you so much for sharing with Full Plate Thursday. HI! Just wanted to let you know I'll be featuring you at this weeks tasty tuesday post! Stop by and grab a featured button. Thanks for stopping by Sisters! Love, love, love, oh the possibilities with this one! Pinned! How amazing is this cake? Wow! It's so beautiful! Thanks so much for linking it up to my Red, White, Blue & You Link Party! I don't know why I didn't see this comment before now … I apologize :/ Thank you for hosting! Hope you have a great weekend! Your cake is amazing! So colorful and festive! I can't wait to make it. Thanks! I love your blog! You always come up with the neatest ideas. I would LOVE for you to pop over and link this up in my Red White and Blue linky! It would be fun having you! 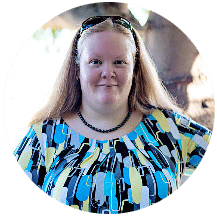 You are so awesome for adding the blog hop on your post! I'm going to add your name into my post as a cohost! xoxo Susie! Thanks for stopping by. Hope you had a great weekend, too! Hi My name is Nann and I found your blog by accident and so glad I did. It is just delightful and I am now following you. I would be thrilled and honored if you would drop by my blog and follow me if you like. Believe me I love to cook and this recipe is going to be at the top of my list for the 4th of July. Thanks for sharing. Thanks for linking up. I love the frosting on this. I think that is my favorite part! Thanks suzyhomemaker 🙂 I can't wait to see what everyone brings to your party! My kids now want this cake. I never was the greatest with cakes so hopefully I will do alright. Beautiful cake Jamie, thanks for linking w/me, pinned. G'day! 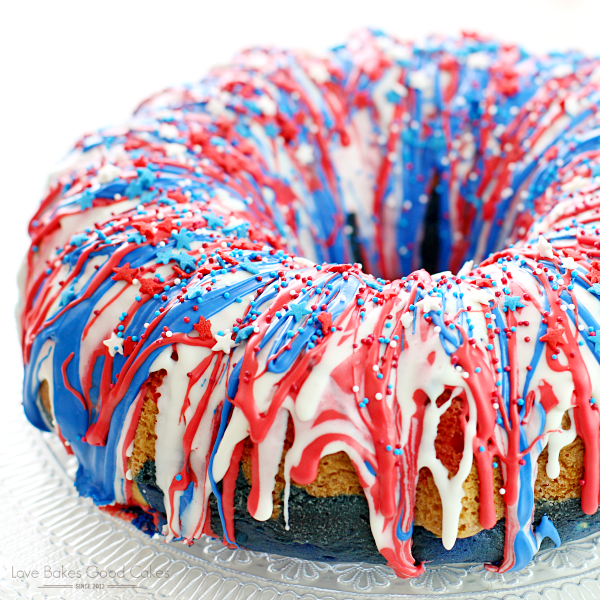 What a GREAT 4th of July cake, true! very colorful and reminds me of childhood summer fun too! I am in love with this cake!!! It's on my list to make for the holiday next week! Thanks for sharing, Jamie! This is a great idea! It is so pretty. I chose it as my host favorite this week for Foodie Friends Friday, so it will be featured Monday on Daily Dish Magazine. Thank you so much for linking up. This cake is so pretty! I also chose it as my host favorite from the Foodie Friends Friday link party! This is one of my favorite cake that you make!! Love the gorgeous colors!! Jamie, this is so pretty and makes me excited for Memorial day! Gorgeous dessert! Jamie!!! This cake is all kinds of fabulous! Oh how fun! I think we have to make this cake this year…my kids would LOVE it! I can't get over how pretty this cake is, Jamie! I'm going to make it for the 4th of July when we're visiting family. I know it's going to make their jaws drop! Beautiful cake! Has anyone ever used white chocolate instead of frosting? I’m not a fan of white cake mix (lack of flavor), so I’m thinking of ways to add more flavor. Thanks! This cake was a hit!! I loved making it and the comments were non stop. It is not overly sweet and was fun to make! !